Submitted by Alexander Briones on Jan. 30, 2019. First published on March 3, 2017 and last updated on January 30, 2019. Bass preamps are standard issue gear for pro bassists, they are sought after for their ability to infuse the sonic behavior of real amplifiers into your sound, while sending your signal straight to PA / recording consoles. They offer a practical alternative to - or can be used to complement - bass amplifiers, which tend to be bulky and complicated to mic, particularly when playing live. For this early 2019 update, we short-listed 21 preamps for detailed analysis and processed over 2,700 rating and review sources to produce our recommended list of the highest rated options below. Each preamp we recommend has a summary report of what bass players who have used them like and don't like about each one. Incidentally, there aren't that many bass preamps in rackmount form, or at least they're not as widely available and popular as their pedal counterparts. Still this one rackmount bass preamp topped the ratings and is well worth a feature position in this list. 95 out of 100. Incorporating 200+ ratings and reviews. Tech 21's SansAmp was first introduced in 1989, and it is considered as the pioneer of amplifier sound emulation via analog components. The SansAmp RBI Bass Preamp stays true to the original formula, albeit with modern improvements. The interface is simple and easy to use, with knobs for adjusting the preamp and EQ sections of the amp. It has dedicated knobs for adjusting the bass, mid and treble frequencies, as well as a knob for adjusting the drive or gain setting of the unit's tube preamp emulation, along with control for blending and overall level. Being in rackmount form factor, it comes with extended input and output options, and it is easier to integrate into your existing racks, which is commonly preferred for their reliability especially when gigging in different venues regularly. Dimensions: 1.5" x 19" x 5.25"
If I were to summarize how the market feels about the SansAmp RBI, it would be that "it sounds good". Its natural sounding tube emulation continues to exceed the expectations of many bassists, including pros. In addition, even pro touring bassists are blown away by how responsive the EQ section is, making it an ideal preamp for those who play songs in different styles. Reliability and build quality are also positively received, with some reporting having had no problems with their unit after years of regular use. There is one user who complained about the lack of a ground lift switch, while there are a few others who are looking for more grit from the drive section. 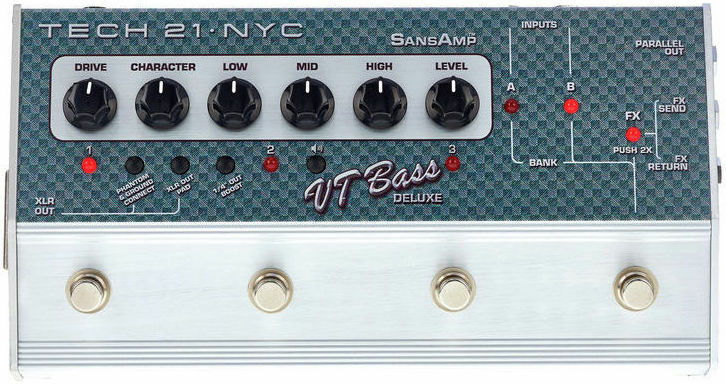 Get the Tech 21 SansAmp RBI If you're looking for a reliable rackmount profile bass preamp. Here we look in detail at bass preamps that come in the bigger multiswitch pedal form factor. They offer more control over the resulting sound, and can usually do more than their smaller counterparts. 91 out of 100. Incorporating 125+ ratings and reviews. 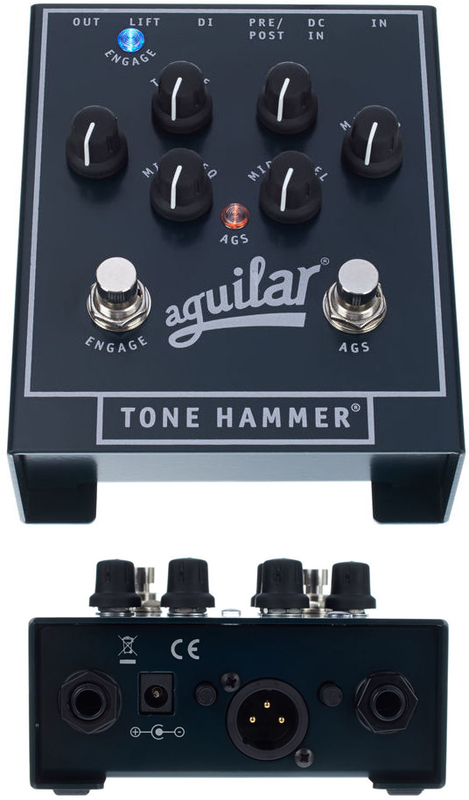 The Tone Hammer is a versatile amp-in-a-box pedal that is especially designed for bassists by Aguilar, a music equipment manufacturer known for their bass-centric products. It follows the same formula as the bass amp head version, although smaller and without the ability to drive speaker cabinets. It features OBP-3 preamp circuit and Aguilar's proprietary overdrive called "Adaptive Gain Shaping" or AGS, which lets you tweak your tone from subtle enhancements to overdrive crunch. It also houses built-in EQ and DI out capability. The Mid Freq and Mid Level knobs let you sweep through the midrange frequencies, allowing for a wide variety of voicings, from laid back to up front. Dimensions: 2.6" x 5.5" x 4.4"
A lot of bassists consider the Aguilar Tone Hammer pedal as one of their can't-live-without pieces of gear, pointing to its sound quality as its best attribute. Many claim that it made them sound better, be it for vintage tones to modern grit, and you can go through a wide variety of tones with just a few knob tweaks. It's rugged build and nice looking interface were also commended. 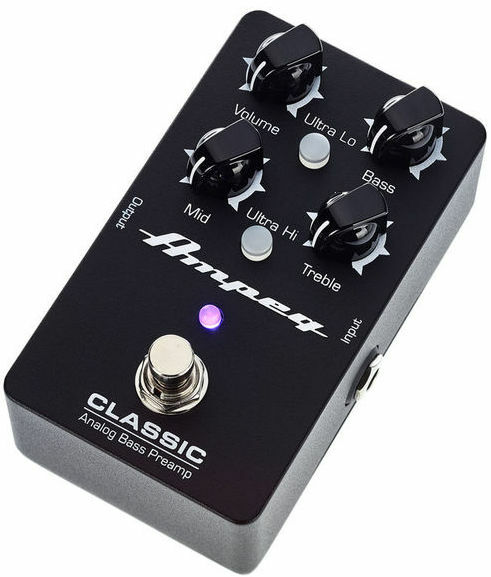 Some people rated this pedal lower because they had to pay extra for the power adapter, but they had good things to say about its overall performance. One user noted that while the design is sturdy, the extra metal sheet that protects the buttons at the top takes up more space, and can also hinder right angled jacks that are often used on pedalboards. For a pedal that can do modern overdriven bass sounds well, the Aguilar Tone Hammer sounds just as good for subtle vintage style tones. Get this one if pedalboard space is limited and you're looking for a versatile preamp. 92 out of 100. Incorporating 100+ ratings and reviews. For bassists who switch between two different electric bass guitars, having a two channel preamp is no longer a luxury, but a requirement. And the SansAmp Character VT Bass Deluxe is meant to meet this need, and provide digital flexibility as a bonus. As expected, each channel is equipped with SansAmp's tube amp voiced analog preamp circuit, and to get more out of the unit, they opted to equip it with a digital brain where you can save and load presets from. This unit offers six presets, which is two times more than what the SansAmp PBDI has to offer, which means more tones to conveniently switch between. It also has a 3-band EQ for tone shaping and sports Tech 21's "Character" knob, which lets you dial different amp voicings, from vintage clean to modern tones. Dimensions: 10.8" x 6.8" x 2.2"
One user aptly put it, the SansAmp VT Bass Deluxe takes the muzzle off your bass. Most of the many positive reviews point to its balance of versatility and sound quality as its best attributes. A lot of users also commended the unit's intuitive controls, which allow for a wide range of tones with little tweaking. Many were impressed with the way the character knob is implemented and how the six presets make good use of its versatility. There were a few who nitpicked on some of the tones. While a few others were a bit concerned with the overall build of the unit, which they feel is not as robust as other SansAmp designs. If you're into the SansAmp tone and want two channel operation and more versatility, then check out the Tech 21 SansAmp Character VT Bass Deluxe. 91 out of 100. Incorporating 50+ ratings and reviews. The RMI Basswitch IQ DI is a 2-channel preamp with expanded connectivity and tone shaping options. It boasts of having a studio grade preamp with a Lehle LTMZ transformer especially tweaked for the lower frequencies needed by bass guitars. The preamp is complemented by a 6-band prametric EQ that can be bypassed or tweaked to your preference. The unit's two inputs and switchable impedance allow for using different types of instruments, from passive to active electric basses, and even piezo equipped acoustic and upright bass. It also houses two effects loop connections, one being always on, and the other with dedicated variable mix knob and footswitch. Finally, the pedal boasts of tour ready build with footswitches that are designed to stop your stomping weight from hitting the circuit-board. Dimensions: 6.38" x 8.66" x 1.65"
Most reviews hail this preamp as a great piece of gear, if not the best preamp ever. One user described the sound as Hi-Fi quality, a sentiment that is shared by many experts and users who are blown away by the sound quality. Professional bassists dig its versatility both in terms of connectivity and sound shaping. The unit's neat and aesthetic appeal are also complemented. There aren't many complaints other than it's above average price tag. If you have the budget and you want the most versatile quality preamp that your money can buy, then invest on the RMI Basswitch IQ DI. Here we look at the best compact bass preamp pedals, all of which provide straightforward operation while keeping space requirement and cost low. 88 out of 100. Incorporating 40+ ratings and reviews. Ampeg is well known for their bass amplifiers, so much so that even their competitors are trying to emulate their sound be it via digital or analog means. The Ampeg Classic Analog Bass Preamp gives you the distinct chunky low-end tone of Ampegs in a compact form factor, complete with 3-band EQ. It also features Ultra-Hi and Ultra-Lo circuits that you can activate, in case you are looking for more higher frequencies and bottom end. Dimensions: 2.2" x 2.6" x 4.5"
The Ampeg Classic Analog Bass Preamp is mostly commended for its sound, which many describe as smooth and life like. Some use it to drive their bass amp, while others use it to tweak and color their sound, be it for adding high or low end. While many are happy with the sound, the pedal's basic 1/4" jacks limits its connectivity. So if you are looking for a preamp with DI output, this is not for you. Get the tried and tested Ampeg flavor by adding this compact preamp to your setup. 94 out of 100. Incorporating 70+ ratings and reviews. The MXR M81 is a bass preamp with equalizer and DI functionality, packed inside a regular sized stompbox. It saves you both money and space, but more importantly, it does not skimp on quality - based on the many positive reviews that it has gathered. For it's relatively small size, it gives you deep control over the EQ section, which includes knobs for adjusting the lows, mids, and high frequencies that are specifically tuned for electric bass guitars. It also has a sweep-able midrange circuit, controlled via a single knob. If tone shaping is not your thing, then there's a Pre/Post EQ switch that lets you bypass the EQ section. The preamp section gives you the ability to control the input and output levels, giving you precise control over how much you want to drive the preamp section independent of the output volume. 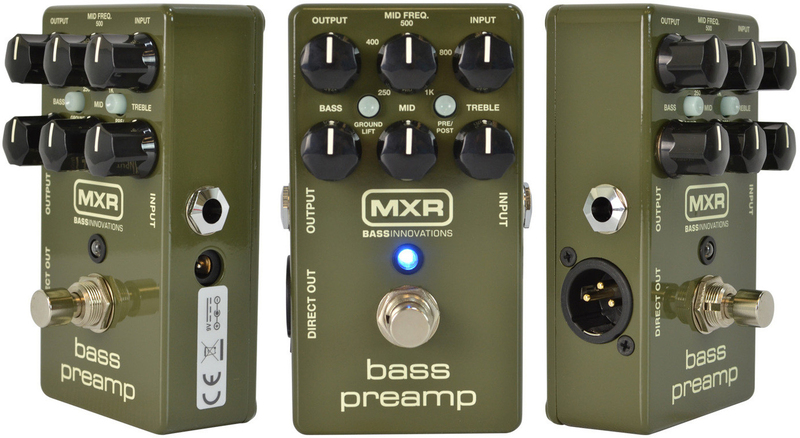 Finally, it features MXR's "Constant Headroom Technology" which allows for improved clarity at higher output levels. Dimensions: 4.5" x 2.5" x 4.5"
To put it simply, the general consensus is that the MXR M81 as a great sounding pedal. Experienced bassists were impressed with the many tone shapes that the EQ section was able to conjure, while others were happy with how easy it was to get to the sweet-spot for set and forget operation. While most use it for subtle tone enhancements, there are a good number of users who use it as their main coloration pedal, which says a lot about its preamp section. Those who were looking for a bit more tube-like growl and warmth found the MXR M81 to be a little too pristine for their taste. One user nit picked on the super-bright LED which they said can be blinding in a dark stage, especially when the pedal is constantly on. For subtle enhancement and coloration, and for rounding off some of the rough edges of your bass tone, the MXRM81 Bass Preamp is highly recommended. 92 out of 100. Incorporating 80+ ratings and reviews. The most noteworthy feature of the Tech 21 SansAmp Bass Driver is its array of control knobs, which is plenty for its compact profile. This means that you can tweak your sound in more ways compared to most preamp pedals. Most of the knobs are dedicated to giving you more precise EQ control, including presence, treble, mid and bass. It also comes with a built-in drive control that lets you add bass friendly distortion as you see fit. 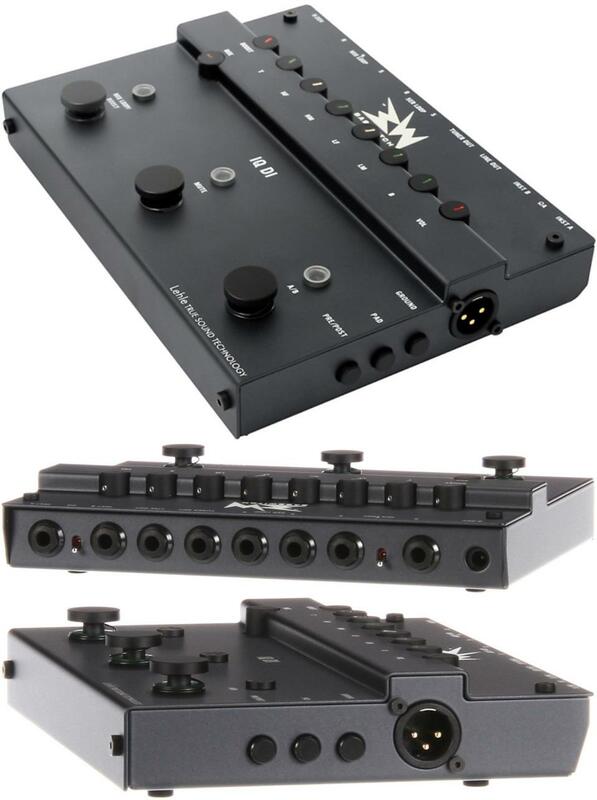 Finally, it comes with three output options for easier implementation into your live or recording rig. Dimensions: 2" x 4.75" 3.75x "
Good sound quality is the most prominent reason why owners rate this pedal highly. One user described the resulting sound as phenomenal, and it nicely summarizes market sentiment. The ability to shape tone also gets a lot of thumbs up, while others are pleased with the unit's versatility, with many vouching for its performance in both live and studio settings. There are no noteworthy complaints, other than a few who feel that they could not get the sound they want from the pedal. 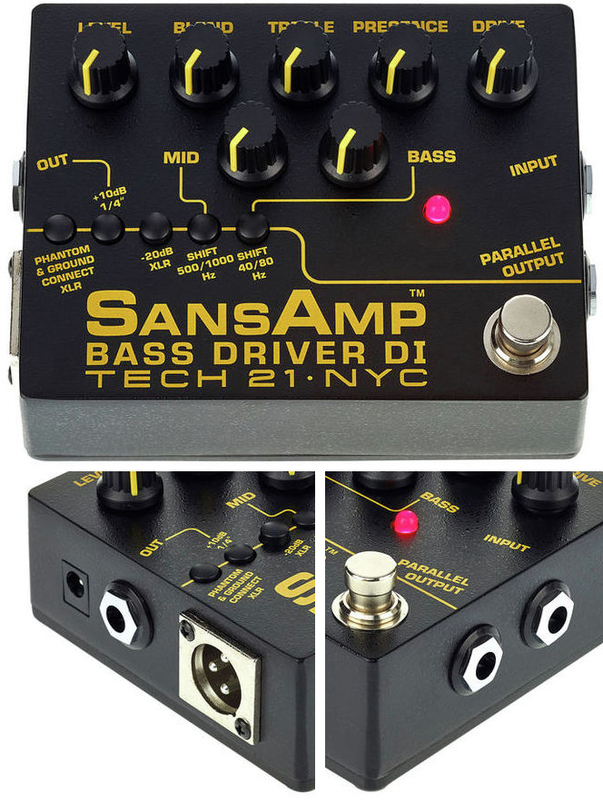 The Tech 21 SansAmp Bass Driver DI V2 is highly recommended for those looking to color or tweak the sound of their bass. Bass preamps are primarily used to improve sound, making them more like an effect that colors the sound. Most bassists prefer preamps that mimic the sound of old tube amps, but there are others who prefer clean and transparent sounds. You can adjust the level of sound coloration via the drive/gain knob, other preamps allow for more precise control via blend/mix knobs and other parameters. Note that aside from giving you direct to PA/Console tones, you can route your preamp to the poweramp section of your bass amplifier to give your amp a different voicing. While ratings provide a good representation of sound quality, your perception of sound quality will always be subjective, mainly dependent on the sound of the artists that you look up to. We've included demo videos so you can have a better idea of the sound of each preamp. In addition to coloration, most preamps let you shape your sound via EQ knobs. Some provide basic Treble and Bass equalization, while others offer more precise control, complete with fully sweepable Mids. They work in conjunction with the preamp to give you more control over the resulting sound. While more knobs do mean more control, be careful not to end up obsessing over the controls instead of making good music. Most bass preamps are meant to work with traditional passive pickup equipped bass guitars. They can also work with active pickup equipped instruments, but the interaction of the active electronics within the instrument and the bass preamp may produce unexpected results. It is recommended to de-activate or bypass the active electronics of your bass guitar if you plan to use them with preamps, unless your preamp has a specific option for active pickups. Most, if not all portable bass preamps come with DI box functionality, and this usually means having at least one balanced XLR or 1/4" line level out. This straightforward option is best for basic use, but there are others that allow for more signal routing options - including the ability to plug in two bass guitars and/or send your dry signal out to a regular amplifier. Some even have dedicated effects loop section, aux in, headphones out and more. We have presented the input and output ports for each unit above so you can choose one that has the connections you need. Unlike mic and guitar preamps that come in a wide variety of shapes, most of the top rated preamps come in pedal format. This makes them easier to integrate into existing pedalboards, and allow for some level of hands-free control. There is one rackmountable bass preamp that made it into out recommended list, and it is ideal if you already have rackmount gear setup, or if you have a trusted roadie/tech that can make sound adjustments for you. Rackmount units tend to have more connectivity and control options, but based on market data, they are not as necessary as pedals for most bassists. Bass preamp pedals are powered by either a power supply or a battery. Power supplies are more convenient, just double check if the pedal already comes with one, because some manufacturers require you to buy them separately. Some of the bass preamps listed above are powered by batteries, and they are recommended for recording, because of their quiet operation. Just note that preamps tend to eat up batteries relatively quickly. We sifted the market for compact preamps that are specifically designed for bass guitars, and like always, we limited our search to those that you can readily buy from major retailers. We did not include compact amp heads and combos because while they do have preamplifier sections, they serve a different purpose, which is mainly to drive speaker cabinets. For this update, we gathered the most recent reviews and ratings, up to January of 2019, and processed the data via the Gearank Algorithm. This gave us the scores that allowed us to rank our short list and select the top performers and market favorites, which we then presented in detail above. For further information about our methods see How Gearank Works. Submitted by Steve Rodgers (not verified) on Mar. 8, 2018. I'm interested in the AVID Eleven Rack as a bass preamp. I was wondering how the Eleven Rack would hold up as a live performance rig as compared to other bass preamps in this review. Given that it's price has been cut in half ($350) makes it more competitive. Not too much information about this. Submitted by Jason Horton on Mar. 9, 2018. I don't think any of the Gearank.com team can advise you on this because we have only researched hardware systems and I'm pretty sure none of us have used a software setup for Bass. Hopefully someone else will read this and provide their thoughts. Submitted by Steven Harnois Jr (not verified) on Oct. 7, 2018. You needed to add the Sadowsky pedal pre to this list. Submitted by Jason Horton on Oct. 8, 2018. It is on our short-list but hasn't yet rated high enough for us to recommend it - you can see it's ratings here. Submitted by Jason Horton on Feb. 2, 2019.